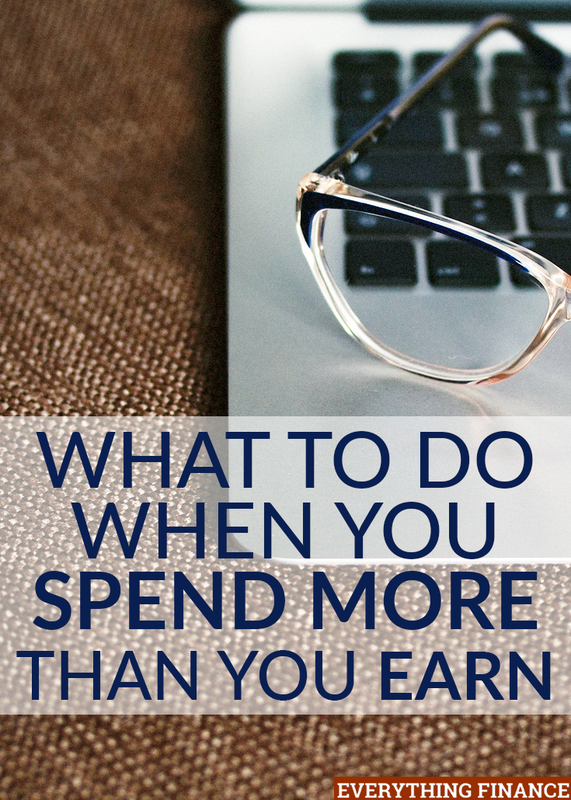 Have you ever had to spend more than you earned? According to CNN Money, Americans with a lower income tend to spend far more than they earn. While some may be choosing to spend more money than they bring in, others may be placed in a situation where they have to spend more to make ends meet. When your expenses exceed your income, you may experience what is called a budget deficit. Even though the less money you earn, the more likely you are to experience a budget deficit, it can occur regardless of what your income is, especially if you experience a job loss or an unexpected lifestyle change. If you are experiencing a budget deficit or fear you may experience one in the future, don’t worry. Here are a few real strategies and tips that [ work which you can implement. If you have an emergency fund, pulling some funds from the account may be necessary to help you handle your budget deficit. Ideally, you should save up a few months’ worth of expenses, or at least $1,000 in case of an emergency. You can build your emergency fund after you receive a lump sum of money like a tax refund or extra paycheck, or you can deposit smaller amounts of money to it each month through an automatic withdrawal. Either way, if you have any emergency savings, you might want to stretch the funds out as much as you can to help get you through the next few weeks while you work on adjusting your income and expenses. For example, if you have $1,000 in a savings account and realize that an extra $200 would help you cover a few mandatory bills or expenses that you otherwise wouldn’t be able to afford, you might want to give yourself $200 from your emergency savings for up to five months, or until you can improve your situation (whichever comes first). Then, restock your fund whenever you run across any extra money. If you don’t have any emergency savings, there are other ways you can handle a budget deficit, but it’s important to make saving a habit at all times. Creating a bare bones budget is something I did so I’d have a plan if I ever had to go into survival mode. A bare bones budget is not like a regular budget. It should only include categories that are an absolute necessity and contribute to your survival. Expenses like housing, food, and utility bills should definitely be included in your bare bones budget, while expenses like entertainment spending, shopping, extra activities etc. shouldn’t apply. While living on a bare bones budget is not necessarily fun, it can drastically decrease your expenses. Experiencing a budget deficit and being in debt is not a good feeling. Lenders expect you to pay your debt each month on time and may penalize you if you don’t. But when it comes down to it, if you have to choose between paying on your debt or paying your mortgage or rent, it’s likely that you will choose to pay to have a roof over your head. If you are experiencing a financial hardship that is causing a budget deficit, you should call your lender(s) immediately and explain your situation. Sometimes, they may be able to extend your payment due date or let you pay extra the following month. If you have student loans, you may qualify for deferment, forbearance, or income-based payments to temporarily relieve yourself of that burden. While it’s a good idea to apply and interview for new jobs, the hiring process with traditional jobs can seem long and tedious – especially if you need money ASAP. A good option would be to reach out to friends, family, and neighbors to see if you can offer them any services. You may find some quick gigs like babysitting, handyman work, office cleaning, or running errands that will allow you to increase your income quickly while you search for jobs and work on establishing higher sources of income. If you are struggling to lower your expenses and make ends meet financially, search for resources in your community that can help. Whether it’s a local job fair, a free clothes closet event, a free community dinner, training classes at your local library, or donations from a local church, find out what your community offers and utilize the help if you need it. Having a budget deficit is never a fun position to be in. Your first line of defense in preventing a budget deficit will be to establish a healthy savings account. Just keep contributing to a high-yield savings account each month and you can’t go wrong. Even when things are going well and you have extra money after you get paid, continue to build up your savings. The next thing you want to do is establish an extra stream of income. You don’t have to side hustle for 20 hours per week year-round, but picking up a seasonal or part-time job, or doing occasional babysitting gigs, can help you establish an additional stream of income that you can use if your regular income ever decreased or became eliminated altogether. The final thing you should do to prevent a budget deficit is to keep your expenses low and live below your means. If you can’t afford it, don’t buy it. Don’t give in to the temptations of lifestyle inflation because 9 times out of 10, it’s not worth it to spend more than you earn. If you want to spend more money, you can always work to earn more. However, once you adjust to living below your means at all times and make it a habit that you feel content with, you may never have to experience the stress and uncertainty that comes with enduring monthly expenses that exceed your income. Have you ever experienced a budget deficit? How did you handle it? What steps did you take to prevent it from happening again?